Set with a brilliant, round cut 1/4ct diamond solitaire in an elegant four claw setting, this beautiful polished 18ct White Gold ring is certain to be treasured. Celebrate your engagement with a one-of-a-kind ring by The Diamond Story, Certificated by GSI. 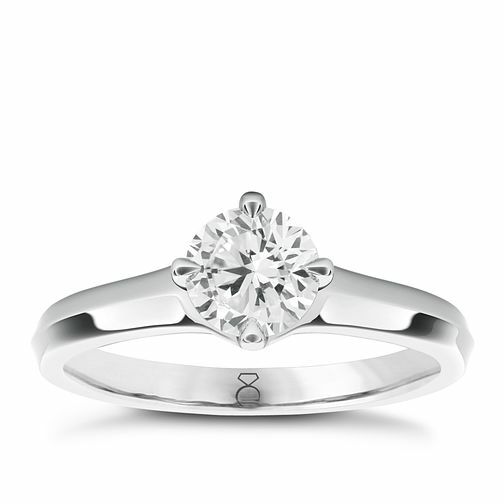 The Diamond Story 18ct White Gold 1/4ct Diamond Ring is rated 5.0 out of 5 by 5. Rated 5 out of 5 by Anonymous from Sstunning ring This is my engagement ring. It is a stunning ring. It is lovely to know it's journey before our purchase too. Rated 5 out of 5 by Anonymous from Engagement ring I received this ring on Christmas Day! I love this ring as it is elegant with a beautifully set diamond. It came with a story book of the origination of the diamond and how it was designed etc. I would definitely recommend this ring to anyone who is ready to pop the question!